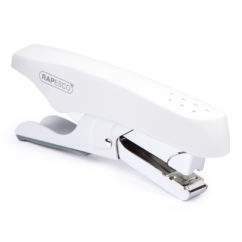 Executive desktop stapling from the Rapesco ECO Spinna in Soft White, supplied with 5,000 staples. This heavy duty front-loading stapler offers 50 sheet (80gsm) stapling capabilities coupled with stylish and ergonomic design ensuring comfortable use and pride of place on many a desktop. 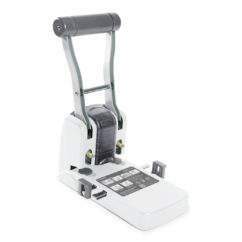 Easy to load, the Spinna features push-button front loading and employs a magazine safety brake system to control the ejection of the magazine. 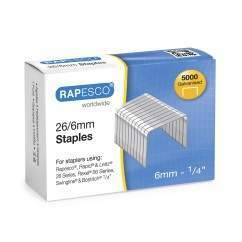 The set includes 5,000 26/8mm Rapesco staples. 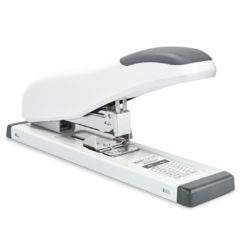 This desktop stapler also features and adjustable paper guide / margin adjuster and a rotating anvil to allow for either staple or pin settings , allowing for permanent or temporary fixing. This set joins our range of product sets that feature some of our most popular items with accessories and complimentary products in great-value sets. 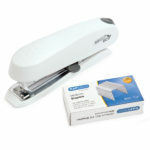 Highly practical and convenient these sets represent great value for money and cover a wide assortment of our products.